Work to waterproof and resurface the bridge will be completed on Friday 31 March. The full closure of the bridge is now lifted. Thank you for your patience with this. Additional bollard and bridge joint works will be completed next week utilising temporary traffic signals during daytime hours between 8am and 5pm. The Parish Council does try to keep any increase in its budget as low as possible and this year (2017/2018) the increase was 0.8% – the 2016/17 budget was £83,100 and the 2017/18 budget is £83,750. However, because the Government no longer gives a grant towards the work of Parish Councils (Local Government Support Grant) the whole budget has to be funded through the Council tax. Last year we received a grant of £4,602 and that is why you see a large increase of 6%. The main expenditure items resulting in the 0.8% rise in the budget are a) Increase in annual Grounds Maintenance Contract, and b) the Parish Council by law now has to pay staff pensions and in line with regulations these were introduced in October last year. The Parish Council owns and maintains the Recreation Ground – this is available for football and cricket, plus we rent out the Sports and Social Club, and the scouts lease the scout hut from us. There are 3 play areas on the recreation ground plus an outdoor gym, hard court and basketball hoop and youth shelter, together with a picnic bench and seats. The Parish Council owns Chase Field and maintains it. It provides a play area and skateboard equipment. In addition to maintaining the Recreation Ground and Chase Field, the Parish Council also maintains other areas within the parish and pays for the maintenance of the churchyard. The Parish Council employs a village attendant responsible for picking up the litter around the parish 5 days a week, and he empties the litter bins. We manage the allotments at the Lion Inn (12 plots all rented to local residents). A village newsletter is produced quarterly free of charge to residents. This is distributed by volunteers. The war memorial in Cranham Road is maintained. Benches and bus shelters are provided and maintained. A free walks guide has been produced and regular parish walks are arranged. The Parish Council is consulted on all planning applications affecting Boreham and comments on them, fighting undesirable development on behalf of residents. 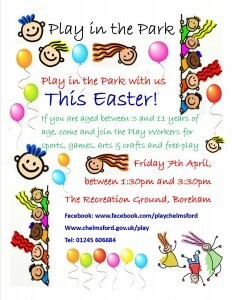 It is now co-ordinating a Neighbourhood Plan for Boreham to enable us to have greater control over future development. The Parish Council has a speed indicator device which we install in Main Road, Plantation Road and Church Road on a regular basis in an effort to make the village safer. We also have speed-watch volunteers. The Parish Council works hard with other authorities to try to get improvements in the village, e.g. working with Essex County Council on traffic calming, repairing potholes, etc., and with Chelmsford City Council on fly tipping, verge/hedge maintenance, dog fouling. 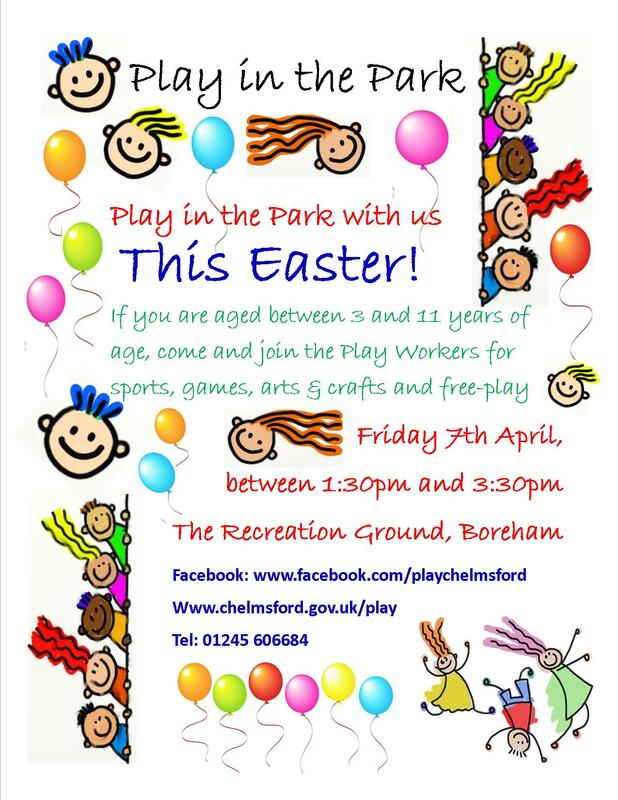 This year the Parish Council has arranged for an Easter and Summer Play-scheme to take place in the school holidays on the Recreation Ground; this will be free of charge to all participants. The Parish Council employs staff to carry out its functions (Clerk and Responsible Finance Officer, Admin Assistants, Play Equipment Supervisor/Handyman, Village Attendant). The Parish Council is very fortunate to have volunteers to help with its work: all of the 11 Councillors give up their time free of charge to help improve our village, we have a volunteer that helps maintain Main Road, a volunteer footpaths officer, Speed-watch volunteers and volunteers distributing the parish newsletter. In an effort to keep the budget as low as possible, the Parish Council also applies for grants and in 2016/17 was successful in getting £10,000 from Tesco Bags of Life fund to pay for the outdoor gym equipment and £3,575 from the Essex County Council Community Initiatives Fund to pay towards the new benches. All of the Parish Council accounts and documents are available for the public to inspect. Residents are also welcome to attend all Parish Council meetings (Monday evenings, fortnightly in the Village Hall – please see the Parish Council website for dates, agendas and minutes). We hold an Annual Parish Meeting when residents can find out what has been done during the year and can have their say on what they would like to see the Parish Council do, so please come along if you can: Monday 24th April, at 7.30 pm in the Village Hall. We hope you have found this informative. PROPOSAL: Demolition of existing building and erection of a flour and feed mill (Use Class B2) including storage, alterations to the access, parking, landscaping and associated ancillary development. Reason 1 The site lies within the Rural Area beyond the Green Belt where Policy DC2 of the Adopted Core Strategy and Development Control Policies Development Plan Document states that the countryside will be protected for its intrinsic character and beauty. Policy CP5 of the Core Strategy and Development Control Policies Development Plan Document seeks to contain urban growth by defining the physical limit of the urban areas of Chelmsford, South Woodham Ferrers and the Defined Settlements. The proposal for a new flour mill does not fall within the categories of development supported within the Rural Area beyond the Green Belt. Therefore the proposal amounts to an unacceptable form of development, contrary to the above policies. The proposed mill proposal would be a significant intrusion into the context of the rural setting, harmful to the character and appearance of the countryside. Reason 2 Policy CP1 seeks to secure sustainable development. The City Council’s Spatial Strategy for the period to 2021 is set out within Policy CP2 which provides the framework for sustainable development. The site is located within the Rural Area beyond the Metropolitan Green Belt. The site is not allocated for development within the adopted Development Plan Documents and lies outside of any Defined Settlement. development through the simultaneous fulfilment of the social, economic and environmental needs of the Council’s administrative area, consistent with the planning policy requirements of the National Planning Policy Framework. Reason 3 The application does not provide sufficient information to demonstrate to the satisfaction of the local Highway Authority that the impact of the development on the highway network, will not have unacceptable consequences in terms of highway safety and efficiency. The Local Planning Authority provided advice to the applicant before the application was submitted. The local planning authority has identified matters of concern with the proposal and the report clearly sets out why the development fails to comply with the adopted development plan. The report also explains why the proposal is contrary to the objectives of the National Planning Policy Framework to deliver sustainable development.